SAVANNAH, Ga. (AP) Gov. Nathan Deal said Oct. 12 that Washington needs to “step up” with more money to deepen the shipping channel to the Port of Savannah, where larger ships arriving through an expanded Panama Canal have pushed cargo volumes to record highs. The Army Corps of Engineers began dredging 39 mi. of the Savannah River between the port and the Atlantic Ocean two years ago using mostly state funds. President Donald Trump requested $50 million toward the $973 million project in his latest proposed budget, but Georgia officials said that's about half the amount needed to stay on schedule. Deal's renewed plea for federal dollars — he made similar statements when President Barack Obama was in office — comes after a year of explosive growth at the Port of Savannah, the nation's fourth-busiest seaport for metal containers used to ship retail goods from consumer electronics to frozen chickens. Savannah handled a record 3.85 million container units in the fiscal year that ended June 30, for an increase of 6.7 percent over fiscal 2016. Griff Lynch, the port authority's executive director, credited giant cargo ships capable of carrying up to 14,000 container units now traveling through the Panama Canal since it finished a major expansion last year. Lynch predicted in his speech the Savannah port could see 4 million container units by the end of fiscal 2018. But Savannah's growth will be held somewhat in check without deeper water because the giant ships currently can't navigate the river with full cargo loads. “We're handling these vessels and it's great, but we're not able to fully load them,' Lynch said. Georgia officials hope to finish the Savannah harbor expansion in 2021. But that depends on funding from Washington. Georgia paid most of its share — $266 million from state taxpayers —upfront to get dredging started in 2015. That money has essentially been spent. Trump's request of $50 million for the Savannah project is about 17 percent more than Obama secured in his last budget. But Lynch said he fears delays starting in 2019 if the project doesn't see a substantial funding increase. “We're going to need $80 to $100 million [annually] or we're going to start having shortfalls,' Lynch said. 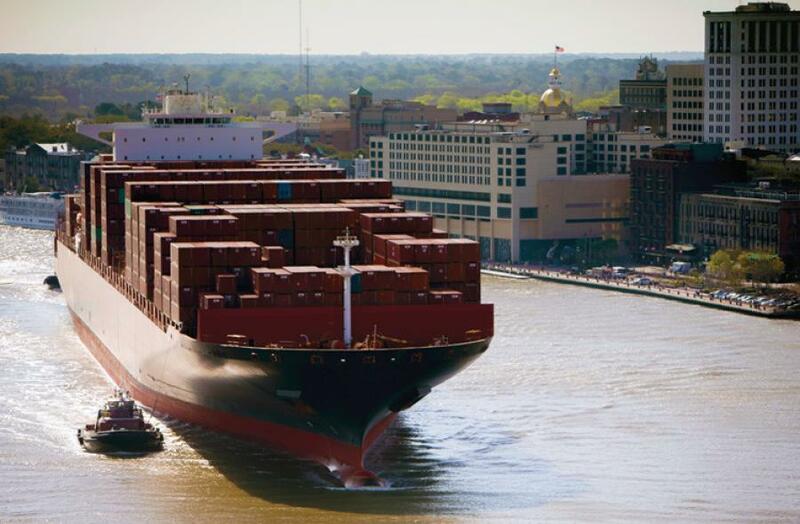 Savannah is far from the only U.S. seaport seeking money to make room for bigger ships. Trump's proposed budget also included a request for $58 million to deepen the Boston harbor. And the Army Corps plans to spend $56 million in discretionary funds on harbor-dredging projects for five ports including Charleston, S.C., and Jacksonville, Fla.